Studying neuro-vascular interactions is essential to gain a better understanding of brain and mind health. Indeed, the brain is highly dependent on a steady supply of blood, which carries oxygen and nutrients, and therefore this noble organ is particularly vulnerable to inherited and acquired cerebrovascular failures. How targeting cerebrovascular remodeling may offer innovative therapeutic options throughout life. Ultimately, identifying key cellular and molecular mediators of cerebrovascular plasticity will lead to important findings about structural and functional determinants of vascular health, an essential pre-requisite for the development of transformative strategies for neuroprotection. Our research focuses on solving fundamental problems with state-of-the-art approaches and a strong translational perspective, and includes a combination of anatomical, physiological, biochemical and genetic approaches. Development, structure and plasticity of neurovascular networks: cerebrovascular patterning; physiological and pathological remodeling of the neurovascular unit. Cerebrovascular physiology: function and permeability of brain blood vessels. Neurological disorders: stroke, vascular dementia, Alzheimer's disease, traumatic brain injury, autism. Neuroanatomy and imaging: histology for light, confocal and electron microscopy (TEM). Mouse genetics: use of reporter lines and of constitutive/conditional mutations. Neuropharmacology & behavior in mice: acute/chronic treatments, assessment of cognitive function. Molecular biology: in vivo and in vitro analysis of signalling pathways involved in angiogenesis, neuroinflammation, and intracellular trafficking. Dr. Baptiste Lacoste's research career started at University of Bordeaux (France) where he developed his passion for neurobiology, for instance studying Parkinson’s disease-associated neuropathological deficits in a mouse model of the disease. Seeking new scientific and life challenges, Dr. Lacoste left France and pursued his graduate training at University of Montreal (2003-2009) under the supervision of Dr. Laurent Descarries. His M.Sc.-Ph.D. work allowed him to acquire a solid expertise in neuroanatomy and neurobiology, while investigating the trafficking of substance P receptors using pharmacology and electron microscopy. 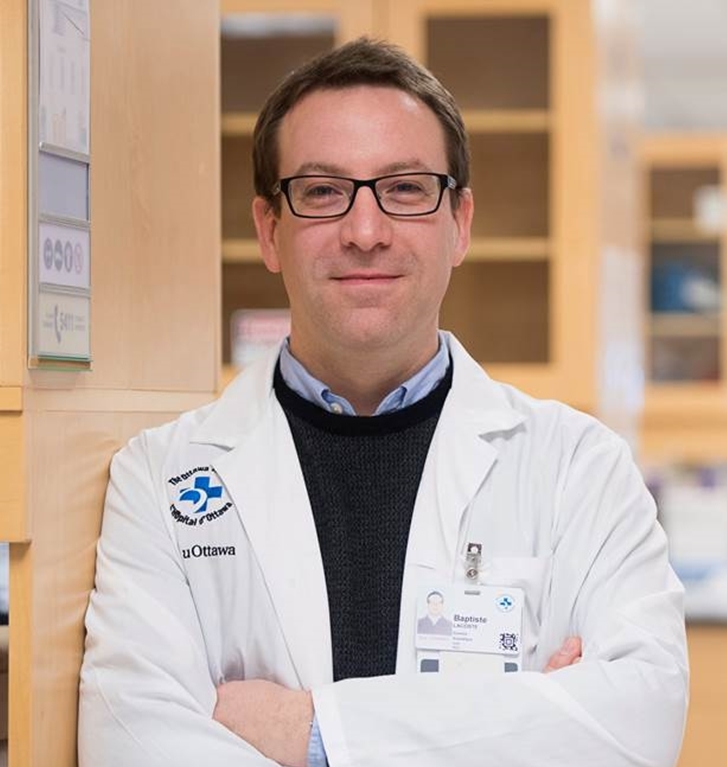 Desiring to expand his knowledge in neurobiology of disease, he continued his training with a first postdoc position at the Montreal Neurological Institute, McGill University (2009-2012). From Dr. Edith Hamel’s lab, he investigated the involvement of bradykinin B1 receptor in the cerebrovascular and cognitive deficits associated with Alzheimer’s disease (AD), using transgenic AD mice, neuropharmacology, neuroanatomy, biochemistry, cerebrovascular physiology and animal behavior. During this postdoc, Dr. Lacoste developed a new passion for vascular biology, which motivated him to further investigate the intimate relationships between neuronal and vascular systems in the healthy and diseased brain. To gain a thorough understanding of neurovascular interactions from a developmental (and genetic) point of view, Dr. Lacoste continued with a second postdoc in Boston at Harvard Medical School (2012-2015). From Dr. Chenghua Gu’s lab, he examined the influence of neural activity on cerebrovascular patterning during postnatal development, as well as the mechanisms governing blood-brain barrier formation and integrity. This allowed him to deepen his knowledge of vascular biology and imaging techniques, and to learn the power of mouse genetics. Along his training, Dr. Lacoste thus established an original research niche based on the conviction that studying neurovascular interactions in the healthy and diseased brain is a very promising avenue in neurobiology at both basic and translational levels.